For the last round of the Bilbao Masters Final, Grandmaster Sergey Shipov commentated on Anand – Carlsen, the showdown between the current World Champion and his young apprentice. It lived up to its billing in a fascinating double-edged struggle that either player could have won. Shipov’s original commentary in Russian is at Crestbook. There you can find a board where you can play through all the analysis. 3…a6 What luck! There won’t be a “Berlin”. 4. Ba4 Nf6 5. 0-0 Be7 6. 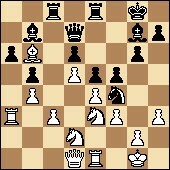 Re1 b5 There was already a threat of exchanging on c6 and taking the e5 pawn. 8. c3 0-0 9. h3 Nb8 But the Breyer Variation is blossoming. It leads to a very interesting struggle to manoeuvre, with space for human ideas. 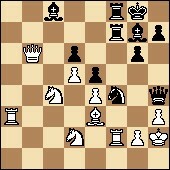 10. d4 Nbd7 The knight has returned to defend the e5 point, freeing the working diagonal for the white-squared bishop. 12…Re8 13. a4 Bf8 14. Bd3 And here’s the main point of the manoeuvre with the white bishop. The pressure on the b5 pawn is vexing for black. 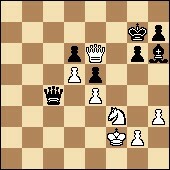 14…c6 There’s no other way of maintaining the pawn structure in a decent condition. 15. b4 A fight for space. 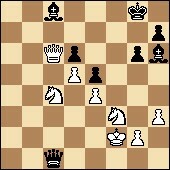 15…Nb6 An attempt to provoke the move a4-a5, which will relieve the pressure on the b5 point. A novelty! 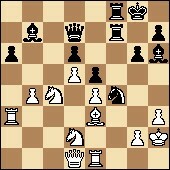 The bishop remains on c1, in order, it seems, to go to war on the kingside. In particular, there’s some point in maintaining control over the f4 point. 18…Nh5 The knight entry on f4, and the f7-f5 break with the destruction of the d5 pawn to follow, are the main constructive ideas for black. 19. Nf1 As you can see, the c1 bishop really is preparing to take on f4. True, it’s not at all clear whether that exchange is necessary for white. 19…g6 After some thought Magnus decided not to test the home preparation of his dangerous opponent. With the move in the game he’s expanding the possibilities of the bishop on f8 and preparing… gradually preparing the f7-f5 blow. The question arises: and what is white intending to do in the ensuing structure if black continues his leisurely manoeuvres? Have you got a plan, Mr Anand? Subtly played. It looks as though the knight is heading to h6 via g4! Or else it’s simply freeing the f1 square for the d3 bishop. 20…Bg7 The Kid has very deftly adapted to the Champion’s novelty. And he’s not behind on the clock: 1.11 – 1.09. 21. Bg5 A cultured provocation. 21…Qd7 Such a logical move wasn’t worth ten minute’s thought. However, there’s still plenty of time: 1.04 – 0.55. The queen on d7 supports the f7-f5 idea, while the white knight going to h6, as far as I can tell in my quick analysis, leads to a sharp struggle with mutual chances. 22. Be3 That’s why Vishy tempted the enemy queen to d7 – so that the b6 knight, deprived of support, is forced to jump forwards. 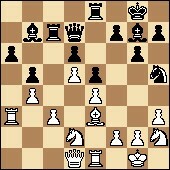 Black is maintaining pressure on the c3 pawn, and therefore keeping the white rook in its passive position on a3. 25. Nhf1 Subtle and subtler! It seems as though Vishy has thought up the manoeuvre Be3-b6 with Nf1-e3 and c3-c4 to follow. Well, it looks logical. The black rook on c7 will come under attack, which gives white an extra tempo. 25…Nf4 The long-awaited move has finally arrived. f7-f5 is next, with the aim of reanimating the dead man on b7. 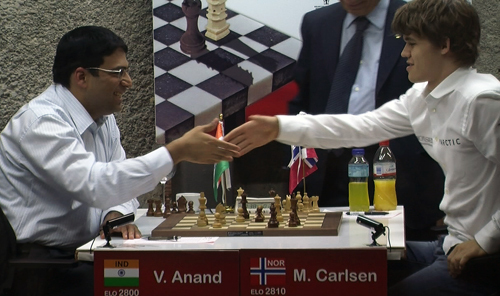 There’s an opinion that Anand’s opening preparation in the current game isn’t the best in his career. Black’s fine. 26. Bb6 There’s also an opinion that on his 24th move Carlsen should immediately have withdrawn his rook from c4 to c8, given that the idea of doubling the heavy pieces on the c-file was fruitless in itself and also dangerous because of the possible bishop move to b6. 27…f5 Well done, Magnus. He’s playing according to plan, consistently, and he knows exactly what he’s doing. A refutation based on an idea. 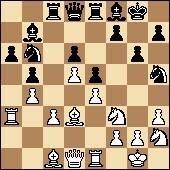 The white pawns, having joined hands, form something like an impenetrable shield against the bishop on b7. However, now the black squares on the kingside have been seriously weakened, which might be emphasised by the bishop on g7 moving to h6. Moreover, in some lines there’s the idea of sacrificing the black knight on h3. You can prepare that with the move Re8-f8. 28…Rf8 Correct. Black can get away with gradually increasing the pressure, as for the moment white isn’t in any condition to demonstrate effective counterplay. 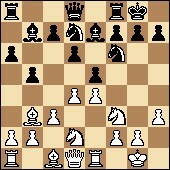 The rook on a3 looks pitiful… By the way, given what I’ve said, it’s worth considering 29. c4. 29. Kh2 Played extremely solidly. However, black gets an extra tempo before the c3-c4 break. 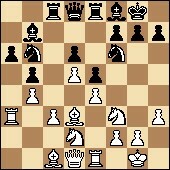 That can be exploited to send the knight to d3, and then the bishop to h6. But not that! Too sluggish a move. 30. c4 Exactly! Anand frees the rook on a3, which will now be able to fulfill important defensive functions on the third rank. At the same time he’s declaring war on the queenside. 30…bxc4 It would be fatal to allow the c4-c5 clamp. 31. 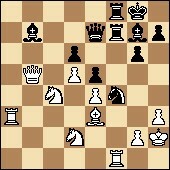 Nexc4 White’s position is becoming more harmonious. The d6 point is under attack, and all his pieces coordinate well. 31…fxe4 One more slightly surprising move. Why clarify the structure prematurely? 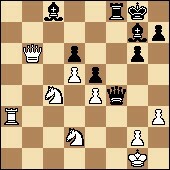 32. fxe4 Things are rapidly changing in favour of white. By the way, on rapidity: 0.29 – 0.28. 32…Rcf8 Black’s rooks look threatening. But who and how are they going to attack? Meanwhile the second game of the day is over. Shirov and Kramnik drew. Now the fate of the first prize is in Anand’s hands. And Carlsen’s, of course! 33. Be3 Freeing up the b6 square – a good idea. Some possible combinations now arise based on suicidal leaps by the black knight. 35. Qa4 Played very boldly and on principle – in the style of a computer. The queen begins its voyage to the d6 pawn… But it’s very difficult to calculate all the lines in which black bravely counterattacks on the kingside. By the way, there’s no longer enough time for that: 0.15 – 0.06. 35…Qe7 Absolutely correct. After the exchange of queens you could resign with a clear conscience. The d6 pawn is too weak. And with queens you’ve got practical chances of getting to the white king. 35. b5 A routine clearing of space. The queen is ready to support the knight in the matter of destroying the weak black pawn. 37…Bc8! Magnus intuitively chooses the most combative continuation. The idea is to send the queen to h4 and obliterate the h3 pawn, the gate leading to the goal. 38. Qb6 The queen is, on the one hand, threatening to take the pawn, while on the other hand it’s preserving the possiblity of returning home along the a7-g1 diagonal. 39. Rf2 That’s the difference – for now white can avoid exchanging on f4. Better late than never! The threat to the h3 pawn is serious. 40. Bxf4 Played in a rush. An inaccuracy, it seems. 41. Rxf4 The safest move. 41…Qxf4+ At last! Magnus thought for so long that I was beginning to suspect that he wanted to make one of two losing moves. 42…Bh6?! Visually this looks like a totally logical move. 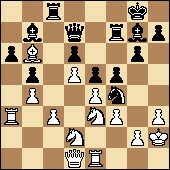 However, it allows the long-awaited taking of the pawn on d6 after the preparatory rook move to f3. 43…Qg5 The Kid is no longer, it seems, in a condition to calculate lines. He’s deathly tired! 44…Rxf3 45. Nxf3 Qc1+ Now if the king goes to h2 there’s a new check on f4. Black is close to salvation. He only needs to find a last finesse. 46…Bd7! Exactly! 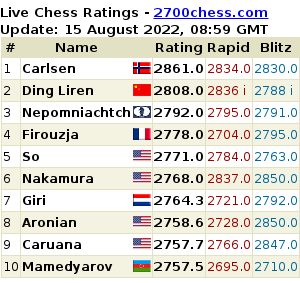 Carlsen manages to exchange his bad bishop for white’s good knight. 47…Qxc4 48. Qe6+ White can still destroy the long-cherished d6 pawn, but there’s no way of avoiding the perpetual checks to his king. DRAW! That was a very interesting and double-edged game, for which both players deserve our admiration. Of course, the World Champion was much closer to victory, but Carlsen skillfully fought back and deserved for Fortune to smile on him. Well done to both! While the overall hero of the day was Vladimir Kramnik – he won the super-tournament in Bilbao. Bravo! Working for you, dear spectators, has been Grandmaster Sergey Shipov. Thank you for your interest in my commentaries. Until we meet again at new super-tournaments! Olympiad Conclusions and Where Now for FIDE? Will there by Shipov’s commentary for Nanjing and if so would you be providing the translation? ….. If both then great. Its such a difference with this translation, previously I used to use google translate and it was horrible compared to the quality here. It looks as though he’s decided to give this tournament a miss. I’d probably have covered it, but I must admit I don’t mind having a break and being able to relax and watch some of the chess! The next commentary will almost certainly be from the Tal Memorial.